Body Attack Citrulline Zero is the innovation on the supplement market. You save 7,50 € respectively 25% ✔ Delivery time 1-3 working days within Germany. 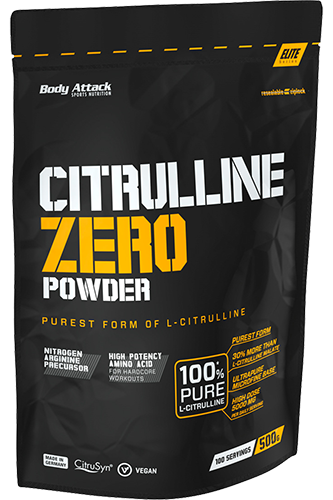 Body Attack Citrulline Zero is the innovation on the supplement market. It is the first product that contains 100% pure citrulline and no further compounds of the amino acid. Conventional products for instance contain the compound malate and therefore in most cases only provide your body up to 70 % of pure L-citrulline. Body Attack Citrulline Zero ensures a smooth regulation of the protein metabolism for amateur and professional athletes and in addition reduces their regeneration times, as an optimal supply of citrulline helps ensure less oxidative muscle damage. Thanks to its high concentration, Citrulline Zero not only contains the strongest form of citrulline available, but also enables the athlete so achieve a higher dosage while consuming the same quantities compared to other products. The added vitamin B6 additionally supports the body and helps ensure a smooth energy metabolism. Furthermore, it delays mental and muscular fatigue. This way, you can train your muscles more intensively and harder. Citrulline Zero is ideal for athletes pursuing muscle development and definition and who want to reduce their regeneration times. In addition, it is a popular supplement during the weight-loss phase.